Ability to enable / disable the “shade” for View Sessions by checking the “Disable Shade” option. This is the menu bar (shade) at the top of the Horizon Client. This prevents the user from resizing or exiting out of the desktop back to the client desktop. This option is only available for fullscreen or multimonitor desktop layouts. This option will be disabled for any other choice. 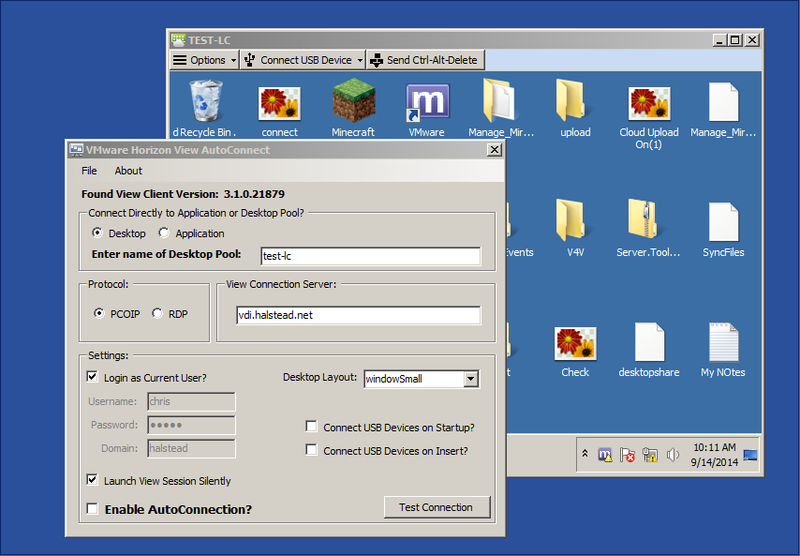 Ability to quit the View AutoConnection Utility automatically when the View Desktop Session ends. This can be useful for for thin clients so the session will automatically log off. Will allow the user to specify a custom command string after the vmware-view.exe executable. By clicking the “Refresh” button, the current command string will be built which can then be modified. When this option is enabled, the application will execute the custom command string specified in the text box. This is a new feature, only supported in 3.1 and later clients. 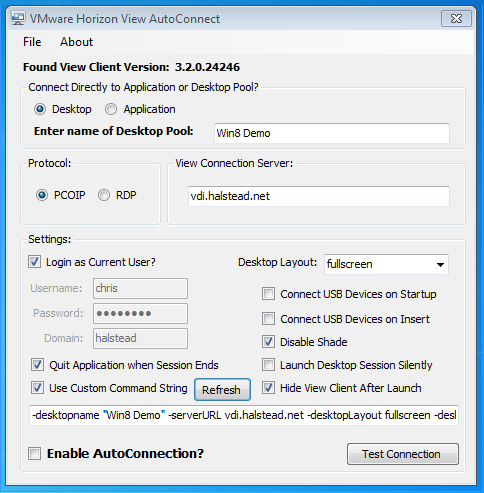 It will hide the View Client and application selector window after launching a remote session. This option will not be enabled for clients earlier than 3.1. The application now checks to see if another copy of the AutoConnection Utility is running and it will prevent the application from launching if it detects another copy running. If a pool had a space in the name, it would not launch and user would get an entitlement error. oops. Everything else is the same as far as configuration and operation as detailed below. I had a few customers recently who are looking to repurpose old Windows based systems as thin clients for connecting to VMware View virtual desktops. They asked if there was a way to directly connect into the users virtual desktop on system startup. There are certainly ways to do it via command line or URI, but I wanted to come up with a easy, consistent way to do it. I decided to write an app in .NET that is essentially a wrapper for the View Client. It creates the command line variables based on what the user configures in the GUI and automatically connects to the specified desktop or application pool. All of the user configured information is stored in the registry under the current user hive. 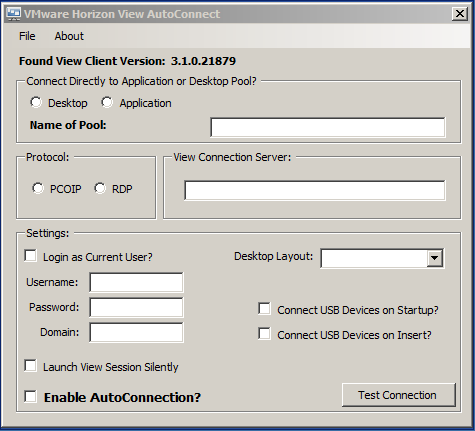 The application silently and automatically connects into either a desktop or application pool each time a user logs in by placing it in the startup folder. Let’s take a look at how to use the application. 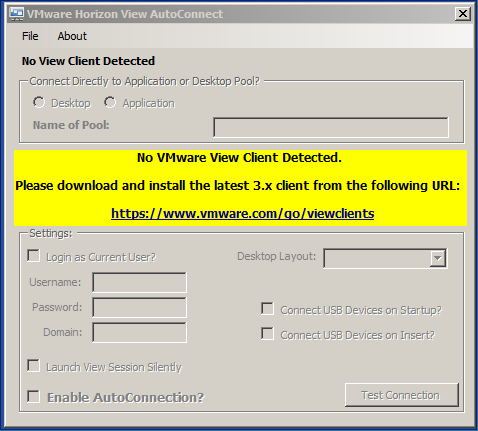 The URL to download the latest VMware View Client is provided in the error message. Once they have the client installed they will be able to configure the application. The first time you launch the application you will need to specify the connection configuration data. The data is saved to the registry in the current user hive and is dynamically saved as it is entered. If any of the mandatory fields are not filled out, you will receive the following error message – this message will appear any time the app is attempting to make a connection if any data is missing. Once this information is corrected you can test the connection to the specified pool. The certificate checking mode is set either on the View Client directly or through Group Policy. Once you have tested your connection, you are ready to enable AutoConnection. You enable AutoConnection by checking the “Enable AutoConnection” box. 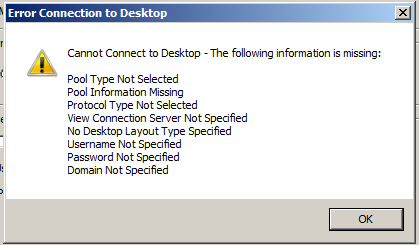 A common use case would be to place the .exe in the Windows startup folder so that every time a user logs in it will automatically connect to the Virtual Desktop. This will run the application with the GUI hidden and will automatically connect to the specified pool. The application will minimize to the system tray and a balloon will indicate the connection process is occurring. At this time the View Session will be connected based on the user specified information. If you need to make changes to the application when it is running in AutoConnect mode you need to find the tray icon and either right-click it and choose “Update Settings” or Double-Click it. This will bring the form back up so changes can be made. The close box on the form minimizes the application to the system tray and does not close it. It will continue to run in the system tray until it is manually ended. To end the application either choose File | Exit from the menu bar or Exit by right-clicking on the tray icon. You will receive the following notice before ending the application. Hopefully this application will be useful for some other people out there. I would appreciate feedback on errors or suggestions for improvement. Please add comments to this post and I will get back to you as soon as I can. This entry was posted in Horizon View, Horizon View Utilities. Bookmark the permalink. Thank you Chris!!! This is very helpful & much needed. How can i disable this utility. i installed it and i need to connect to multiple desktops. i have tried unselected the autoconnection and it does not work. Alan – So it is connecting to the desktop automatically even after you disable auto-connection?